This week’s blog describes three examples of water innovations. In the first case an entrepreneur fights city hall to provide a source of clean water for residents of Mexico City. In the second case, a state government entity agrees to pay a publicly traded commercial entity to store water on private land in Florida. In the third case, an engineer calls for a water revolution. Mexico City faces a severe water crisis. The Valley of Mexico aquifer is being overexploited to provide water to its 21 million residents. As a result, the city is sinking about 1 meter every 10 years. And yet, citizens of Mexico City still lack sufficient drinking water. Mexico City’s water pipes are old and cracked, springing thousands of leaks that the city government cannot keep repaired. It is estimated that 40% of the available water is lost through these leaks. Some 36% of households are without access to a constant daily flow from their faucets. This lack of drinking water is posing a major health risk, and Mexicans try to compensate by having the highest consumption per capita of bottled water in the world. Without investing billions of dollars in infrastructure to replace the entire system, the government will continue to fail to deliver safe drinking water to its citizens. In crisis mode, and in large part to reduce the probability of political unrest, city officials are delivering water by truck at great cost (PBS Newshour, PBS NOVA). 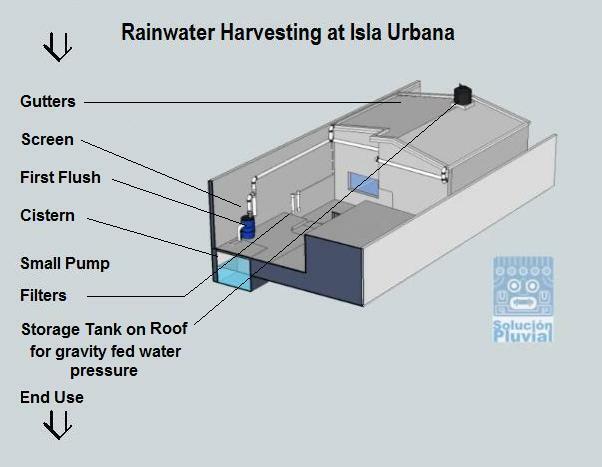 Enrique Lomnitz, an engineer from MIT with an industrial design degree, has developed a low cost rain water harvesting system and established Isla Urbana to build such systems and educate local residents on harvesting and using rain water. His system, at a cost of $1000, when applied to a typical roof and under average annual rainfall, can provide enough water for two families per year. Mr. Lomnitz estimates that widespread installation of such systems could provide for 30% of Mexico City’s water needs. To date only 1500 rain harvest systems have been installed. The challenge that Mr. Lomnitz and Isla Urbana face in building widespread adoption for this innovative solution is political, governmental inertia, rather than technical. (PBS News Hour). In Florida, water districts are challenged by the unequal and intermittent flow of fresh water into lakes, estuaries, and ultimately the Everglades following heavy rainfall. This challenge impacts agriculture, the environment, the economy of Florida, and the quality of life for its residents. Under a recent agreement between Florida’s oldest and largest water management district (the South Florida Water Management District), and a major agribusiness with the largest citrus production in the US (Alico, Inc.), more than 34 billion gallons of water will be stored on approximately 35,000 acres of ranch land. This agreement is a first under a Dispersed Water Management program and makes use of private properties to store water and manage its release to avoid overwhelming Lake Okeechobee and coastal estuaries during heavy rain seasons. Property owners gain financially in return for providing a critical water management option. 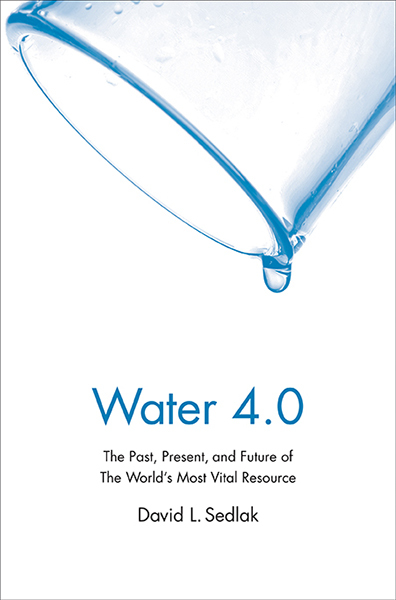 “We require a fundamental change in our relationship with water”, says David Sedlak, UC Berkeley professor of civil engineering, co-director of the Berkeley Water Center and author of the recent book Water 4.0: the Past, Present, and future of the World’s Most Vital Resource (Yale University Press, 2014). Over the centuries there was Water 1.0, when Rome built aqueducts and disposed of waste. Water 2.0 saw 19th century Europeans chlorinate and filter drinking water; followed by our present system, Water 3.0, that treats sewage as well. But according to Sedlak, now it’s time to update to Water 4.0. “If the system remains hidden underground and people just turn on the faucet and don’t think about all the effort that goes into getting the water to them, we can’t have an intelligent discussion about water supply”, Sedlak says (PRI). However, according to Sedlak’s optimistic view, the very crises we face, such as the severe drought that California faces, may just result in sufficient collective will to accomplish a major shift in our relationship with water. In a recent interview (NPR) Sedlak expressed his optimism that rapid advances in electronics, materials science, and biotechnology will help us solve current challenges. The first principal of Water 4.0 involves continuing to adopt new technologies for indoor plumbing and elsewhere in the entire water system, technologies that allow greater water conservation. Technology solutions include switching to top-loading washing machines instead of front-loading washing machines and installing more efficient toilets. The modern flush toilet uses 1.5 gallons per flush, whereas vacuum toilets (think airplane toilets) can reduce that flush to 10% of that amount. The second principal of Water 4.0 refocuses urban residents on local solutions that capture and recycle water. Capturing urban storm water run-off (USG), using seawater desalination plants, and sustaining urban aquifers are all ways to move water management to a local level. While building a reservoir in the middle of a city is nearly impossible, many cities already have urban aquifers underneath them that can store water (NPR). Other local solutions include recycling more water either by returning grey water (water from bathroom sinks, showers, tubs, and washing machines) for use in flushing toilets (greywateactionr.org) or by recycling sewage after it’s been treated and returning the clean water back into the water supply. According to a 2014 report by the Pacific Institute and Natural Resources Defense Council (NRDC), if Californians adopt aggressive conservation, water reuse, and rainwater capture practices, the state could save up to 17.3 million cubic meters of water, more than the amount of water used in all of California’s cities in a single year. Sedlak and others point to Australia’s response to their millennial drought that ended in 2009 as an experience from which Californians can draw important insights. A summary of Australian responses can be found in a presentation at the Public Policy Institute of California on January 12, 2015 by Jane Doolan, fellow of natural resources governance and member of Australia’s National Water Commission. Improved the water grid at the highest level to enable the movement of water. Adopted efficiency in all sectors:urban households, industry, and rural irrigation systems. Improved infrastructure and adopted smart river management to enable water movement. Gave tools to entitlement-holders to allow them to manage their own risk. Made the water market able to operate under extreme circumstances. Shifted to an environmental paradigm that was practical, pragmatic, and easily understood. The innovations described above are examples of how countries, states, cities, water management districts and individuals are going beyond incremental improvements to their water management to solve critical water problems. The current drought being experienced by the Western United States has brought water conversation to the forefront of the political conversation. Earlier this year California Governor, Jerry Brown, declared a state of emergency, and President Obama announced hundreds of millions of dollars in aid for the agricultural industry and affected communities in the West. Some fear that the drought that California is experiencing may become the new normal, bad news for a state that relies on agriculture as one of its main industries. Even if drought is not the norm for the West, it behooves California to improve its water-use efficiency, as growing population will continue to stress the state’s water resources. Significantly decreased water levels at Lake Oroville, evidence of California’s extreme drought. Justin Sullivan/Getty Images. California lacks any significant policy response to the “state of emergency” Governor Brown announced in February. Neither the state government nor any significant number of local water agencies have called for mandatory restrictions of water use. In order to properly respond, the state of California will need to make significant changes in water-distribution infrastructure to ensure that man and the rest of nature have access to adequate resources. The use of recycled wastewater plays a large role in supporting California’s population and economy, but has significant room to grow. The California Water Recycling Act passed in 1991 set goals of 700,000 acre-feet of recycled water in 2000 and over 1,000,000 acre-feet in 2010. Since the passage of the Water Recycling Act, many other bills, acts and policies have moved through the state government encouraging and creating incentives for the public to increase their usage of recycled water. Nationwide, the United States only reclaims about 7% of its municipal wastewater. In comparison, Israel reclaims more than 70% and Australia reclaims 8% with a national goal of 30% by the year. Reclaimed wastewater can be used for agricultural irrigation directly, i.e. water is transported directly to farms, or indirectly, where reclaimed water is disposed of into rivers where it can be used by anyone with access. Different crop types require different levels of treatment according to the California Department of Public Health. Undisinifected secondary treated water can be used for orchards and vineyard crops so long as there is no contact with the edible crop, and for all non-food bearing trees and fodder or fiber crops. Food crops that have their edible portion above ground can use disinfected secondary treated water. Any crops that have an edible portion underground require disinfected tertiary treated water. Pongamia orchard planting in Arizona, irrigated with recycled wastewater. Due to the drought over 420,000 acres of cropland are our of production and the California agriculture industry is expecting to see a loss of $1.5 billion dollars due to reduced crop production and water pumping costs. In 2009, over 669,000 acre-feet of recycled wastewater were used in California, well short of 1,000,000 acre-feet goal set forth in 1991. Approximately thirty-seven percent of that recycled water went to agricultural irrigation. According to a report co-authored by the National Resources Defense Council (NRDC) and the Pacific Institute, there is significant room for the use of recycled wastewater to expand, citing a number of an additional 1.2 to 1.8 million acre-feet (reference the report). Two-thirds of which would occur along the coast where treated wastewater is normally released into the ocean or streams. Urban re-usage would not go directly to agricultural re-use, but would instead be reused for urban uses such as landscape irrigation. An expansion of the use of recycled water in both urban and rural areas would provide a more reliable, local water-supply and reduce vulnerability to drought. When is a new crop not a fad and can farmers go it alone? A recent report on American Public Radio’s Marketplace entitled Superfood fads: Super distracting for global farmers?,(American Public Radio Marketplace May 22, 2014 ) got me thinking again about new crops, “one of the biggest debates in international agriculture”. The debate centers around whether to improve the already domesticated major crops or domesticate new promising plant species and develop new crop varieties. Brazil’s success with soybeans illustrates the power of new crop varieties introduced in the right place along with appropriate agronomic practices to enable scaling to such a large extent that it goes well beyond a fad. Today, Brazil is the only agricultural power in the tropics. Its share (8%) of global agriculture markets is second only to the United States (17%), and may well, according to some analysts, overtake the US in the coming decades. Brazil’s projected growth in agricultural production is estimated to be 38 % from 2010 to 2019, a rate nearly twice the global average and considerably higher than the US, Canada, and the European Union, current world agriculture giants. (OECDI FAO, 2010). How Brazil became a major global agricultural power house, the only tropical country to do so, and how it adapted a temperate climate crop to the tropics with advances in plant science, crop science, and appropriate agronomy provides valuable lessons for other countries that aim to develop new crops and introduce them on a large scale. The Brazilian government took a major strategic leadership position in developing new crops for a previously nonproductive area on a huge scale. Farmers did not “go it alone” nor take all the risks inherent in such agricultural innovation. The major strategic innovation that the Brazilian government took was to create a remarkable research entity, Empresa Brasileira de Pesquisa Agropecuária (EMBRAPA) in 1973. The Brazilians elected to create this new agricultural research entity as a state-owned company affiliated with but with independence from government agencies under the Brazilian Ministry of Agriculture. Furthermore, while the EMBRAPA budget has remained strong since its creation, the US investment in agricultural research funded by the national government has been declining for the previous decade (American Society of agronomy and crop science). What did EMBRAPA scientists do that enabled the successful adoption of a new crop and the creation of a large scale soybean industry in the Brazilian savannah? (Economist Aug 26, 2010). First the Brazilians recognized the potential of their Cerrado. Brazil has more than 300 million hectares of arable land with seasonal rains and most of this land is in the Cerrado. Brazil has almost as much farmland with more than 975 millimetres of rain each year as the whole of Africa. Even today, only 50 million is being actively farmed. Second EMBRAPA scientists and farmers improved the Cerrado’s pour soils that are acidic and poor in nutrients. They applied industrial quantities of lime (pulverized limestone or chalk) onto the soil to reduce its acidity. By the early 2000’s 25 million tonnes of lime were applied to Cerrado soils annually. EMBRAPA scientists also bred varieties of rhizobium, a bacterium that helps fix nitrogen in legumes and which works especially well in the soil of the Cerrado, reducing the need for fertilizers. Third, by traditional breeding and selection, EMBRAPA worked out how to make soy also grow well in a tropical climate. All other big soybean producers including the United States and Argentina have temperate climates. EMBRAPA created varieties of soy that are more tolerant than usual of acid soils (even after the vast application of lime, the Cerrado is still somewhat acidic). And it sped up the plants’ growth cycle, reducing the usual cycle by 8 to 12 weeks. These short growth cycle soy varieties have made it possible to grow two crops a year in Brazil. Now farmers can harvest a first crop in February, leaving enough time for a full second crop before the September planting, accounting for a lot of the increases in yields. Fourth, EMBRAPA pioneered a method under which the soil is not plowed nor is the crop harvested at ground level. Instead, the crop is cut high on the stalk and the rest of the plants are left to rot. Next year’s crop is then planted directly into the organic mat. In this way, more nutrients remain in the soil. Today more than 50% of Brazilian farmland is cultivated this “no-till way”. EMBRAPA continues to innovate, pioneering new agricultural practices such as integrating forest, agriculture and livestock. Fields are used alternately for crops and livestock while rows of trees are also planted in between the fields, where cattle can forage. This integration has enabled farmers to rescue degraded pasture lands and increase the intensity of land use so as to produce more without cutting down the Amazon forest. In this way, Brazil is making its agriculture more sustainable. On the other hand, are there situations like the Brazilian Cerrado that cry out for new crops and are there other crops that have the potential to go beyond being a fad? After all, all crops were plant species of only potential value at one point in history. Cultivation of crop is readily adopted with existing farming infrastructure and methodologies, “drop-in”. Clearly national priorities matter when innovation is at stake, and agriculture for Brazil continues to be a national and strategy. No wonder that some analysts predict Brazil will overtake the US in its share of global agriculture markets! The public good will be best served when there are public policies and support in place for new crops to be tested, developed, and validated along side of continued innovations around the major existing commodities. far below the $40 billion the Republican-controlled House had sought, it is above the $4.5 billion targeted by the Democratic-led Senate. Anti-hunger advocates remain worried about the impacts of this reduction on Americans in need. For the crop insurance portion of the Farm Bill, under the former direct payment program the federal government paid $5 billion/year to farmers regardless of need. The 2014 Farm Bill eliminates direct payments and expands the federally subsidized crop insurance program. Farmers will pay an insurance bill every year and will only receive support from that insurance in years when commodity prices fall or when unexpected weather disasters occur. The federally subsidized crop insurance program will pay 62% of farmer’s insurance premiums. The Farm Bill also addresses a host of other issues and programs which are critical to the future of agriculture, food systems and rural communities including: the environmental impacts of farming, conservation, agricultural industry structure, trade policies, food and agricultural research, and the vitality of rural economies. Below is a more detailed list of specific provisions within the 2014 Farm Bill. Repeal Direct Payments and limit protective risk management to situations where significant losses are suffered. Reduce payment limits, tighten eligibility rules, and streamline means tests to make farm programs more accountable. Strengthen crop insurance to ensure farmers invest in their own risk management. Offer dairy producers a new, voluntary, margin protection program without imposing government-mandated supply controls. Reauthorize and strengthen livestock disaster assistance. Support small businesses and new farmers and ranchers with training and access to capital. Close the “heat-and-eat” loophole that artificially increases benefit levels when states provide nominal LIHEAP assistance. Establish a 10-state pilot to empower states to engage able-bodied adults in mandatory work programs. Prohibit USDA from engaging in SNAP recruitment activities, and advertising SNAP on TV, radio, billboards & through foreign governments. Ensure illegal immigrants, lottery winners, traditional college students, and the deceased do not receive benefits. Ensure SNAP recipients are not receiving benefits in multiple states. Prevent abuses such as water dumping to exchange bottles for cash. Demand outcomes from existing employment and training programs. Prohibit states from manipulating SNAP benefit levels by eliminating medical marijuana as an allowable medical expense. Allow states to pursue retailer fraud through a pilot investigation program and crack down on trafficking through data mining, terminal ID, and other measures. Increase assistance for food banks. Consolidate 23 duplicative and overlapping conservation programs into 13. Provide one year of full funding for the Payment In Lieu of Taxes (PILT) program, funding vital services in communities containing federal lands. Provide certainty to forest products industry by clarifying that forest roads should not be treated as a point source under the Clean Water Act. Create a permanent subcommittee within the EPA Science Advisory Board to conduct peer review of EPA actions that would negatively impact agriculture. Eliminate duplicative reporting requirements for seed importers; requires improved economic analysis of FDA regulations. Fund specialty crop industry priorities such as Specialty Crop Block Grants. US Farm Bill Void: Does it Matter? Why have Farm bills been politically divisive and controversial? What groups will a new Farm Bill impact and how? Each Farm bill since 1933 has contained a requirement for revision and reauthorization of the components within the bill called “titles”, thus Farm Bills come up for reauthorization approximately every 5 years. Farm Bills have evolved to set policy and regulations for all the USDA policies, funding programs related to supplemental nutrition, land payments, crop insurance, environmental practices, some international trade, and research. Different elements of the Farm Bill programs have supporters and opponents, but the most contentious is probably what has grown to be the most costly of the titles, the Supplemental Nutrition Assistance Program (SNAP, formerly food stamp program). SNAP funding accounted for 68% of the 2008 Farm Bill. Under Obama’s 2009 Economic Recovery Act provisions, SNAP benefits were temporarily extended and funding increased such that 15% of Americans currently receives some SNAP benefits. The Previous Farm bill, The Food, Conservation, and Energy Act of 2008 expired at the end of September of 2013. Although the Senate and the House of Representatives each passed a version of a new Farm Bill, the two versions have significant differences, and the two chambers so far have failed to reach a compromise to resolve the differences. At issue is how deep to cut Farm Bill Programs to help reduce the federal budget deficit. Other than SNAP what else can’t Congress agree on? The two chambers of Congress have narrowed their differences but critical issues remain unresolved. Among these remaining differences is whether to base program support on whatever acres a farmer or landowner decides to plant in the future or on some historical base, or on some combination of the two. How or whether this issue is resolved will have significant impact on continuing efforts to protect the environment and available natural resources as well as on world trade litigation. Both the expiration of the 2009 temporary extension and the failure of Congress to pass a Farm Bill have led to a reduction in SNAP payments to 47 M Americans, that began in November, 2013. (http://www.usatoday.com/story/news/nation/2013/11/01/food-stamps-snap-cuts-farm-bill/3346341) It is sobering to consider the long-term impacts of more Americans going hungry more often. Hungry people cause social unrest as experienced in the Great Depression and as seen outside Europe and the US more recently. It remains to be seen whether the US will experience its own social unrest. Subsidies to farms growing commodity program crops (corn, cotton, wheat, rice and soybeans are heavily favored) have been funded through preceding farm bills. Such subsidies represented the second highest funded title in the 2008 farm bill at approximately 12% of total spending. Without a new Farm bill, many of the current Farm Bill programs revert back to 1949 permanent law as of January 1. At that time, farmers weren’t supported with direct federal subsidies, but instead with several market tools that provided a price floor for many of the primary commodities. Without a Farm Bill at all, government price supports will become even more confusing. Some crops will no longer qualify, and commodity prices will become less stable than they currently are. Many farm commodities are currently trading at higher-than-historical prices and the reversion to previous policies won’t impact these crops. The current price of corn is above the support price of $5.70. Wheat, on the other hand, is trading high, but is significantly below the pre-farm bill support price of $13.13. Permanent law would therefore require USDA to purchase U.S. wheat at $13.13, thereby keeping wheat prices at that high level. Soybeans, as one example, weren’t grown much in the United States 60 years ago and were not considered a program crop. There will be no USDA support for soybeans without a Farm Bill. Farmers will have an incentive to plant crops that receive price supports—wheat, rice, corn, sorghum, barley, oats and upland cotton, with particularly strong incentives for wheat and rice. Furthermore, three of the conditions that allowed price support policies to be effective in past decades—supply management, grain reserves and limited international trading of agricultural commodities—are no longer relevant. At TerViva, we are working with farmers and agricultural companies to introduce a new oilseed tree crop, pongamia, on a commercially viable scale. Public policies that add to farmers’ financial incentives to only plant a limited number of current commodities act as impediments to the adoption of new crops such as pongamia. The adoption of conservation practices on private lands has been one of the quiet success stories of agricultural policy over the past 25 years. Farmers have taken advantage of Farm Bill’s programs for conservation projects on farmland, particularly the Conservation Reserve Program (CRP). The CRP currently protects about 31 million acres of environmentally sensitive agricultural land. Without a Farm Bill, the USDA will no longer have authority and funding capacity to contract with farmers for conservation projects. (http://www.usnews.com/news/articles/2013/10/28/why-you-should-care-about-the-farm-bill) The absence of a farm bill is likely to result in greater soil erosion and poorer water quality. A 1985 USDA study (http://naldc.nal.usda.gov/download/CAT85844031/PDF) on the impacts of a return to permanent law (i.e. when a Farm Bill expires) predicted an highly unstable agricultural economy. Such unpredictability and fluctuations will hurt everyone who consumes, produces, or grows food and other agricultural products whether they live in cities or rural areas. Informed citizens on both sides of the political spectrum agree that we the government’s role in agricultural policy requires significant attention. However, given the current contentious political climate, it is unlikely we will achieve consensus in the foreseeable future. Congress might consider taking a lesson from early stage entrepreneurial companies like TerViva for whom doing nothing is often significantly worse than doing something that is flawed. Flawed programs can be revised and improved. No action at all is likely to lead to serious disruption of US agriculture. Hardee Senior High School in Wauchula, Florida to share in the celebration and plant pongamia with students and teachers. Our visit with the students and teachers provide us an opportunity to reflect on the nature of agricultural education, why agricultural literacy is an important national goal, and what contributions a small innovative agriculture company like TerViva can make toward achieving our national agricultural literacy goals. Young pongamia trees in their new home on the Hardee High School campus. Agriculture is broadly defined as the cultivation of animals, plants, fungi, and other life forms for food, fiber, biofuel, drugs, and other products (for example bio-based chemicals) used to sustain, and enhance human life. (wikipedia). The cultivation of these life forms for human benefit is based upon scientific principles and requires the significant manipulation of the natural world. In addition to science and technology, agriculture has a financial dimension. Furthermore, because agriculture is a major economic activity with environmental and social impact, agriculture operates within the confines of public policy. Agriculture and education were related and intertwined disciplines for much of the history of the US because two hundred years ago nineteen of every twenty Americans lived in rural farm-based communities. However, by 1920 this number had dropped to one in two and by the 2000’s that number had fallen further to one in five. (urbanization of the US). Parallel to urbanization, the evolution if technology has continued to drive the sophistication and complexity of agriculture on many fronts including: the selection and breeding of crop varieties for higher yields, the further improvement of crop varieties through genetic engineering and whole genome association technologies, the increasing sophistication of farming mechanization, application of pest management and soil nutrient chemicals, and more recently the advent of large historical data sets of environmental factors within small zones of fields and algorithms to correlate this environmental data with inputs and yields to aid farmers in maximizing yields and profits. In the US today, fewer that 2% or our more than 300 M population are actively engaged in farming. These farmers not only feeds the US population, (feeding on average 140-150 people per farmer) they also produce in aggregate $179B of outputs or ~1% of our GDP. This US agricultural production/capita (at $49.5 B USD) is second only to that of Australia ((at $66 B USD). For ~70% of Americans, high school, is the end of formal education, while 100% will need to eat; clothe, house and transport themselves; and consume a vast array of items produced from chemicals coming from agricultural sources. In addition to their personal consumption, Americans will be impacted by the tension between the need for agricultural labor and immigration policies. Citizens with greater agricultural literacy will be better able to influence the political process in ways that result in positive impacts on the agricultural system that produces the wealth of products that sustain American life. Therefore, high schools need to provide their students sufficient agricultural education so that students leave high school with a basic level of agricultural literacy. Want to improve your own agricultural literacy? Check out the learning resources online at http://www.agclassroom.org/. For our part, at TerViva we look forward to supporting the students and teachers of Hardee Senior High School, in particular supporting student science projects to address questions about pongamia biology and cultivation. While driving economic growth, the gain from this rise in production and export of soybeans has come at both environmental costs that include a significant impact on the Nitrogen Cycle and the social costs of further exasperating Latin America’s legacy of inequitable distribution of wealth & power inherited from its colonial history. Focused on sustainable agriculture solutions including the cultivation of environmentally and economically sustainable crops, TerViva is partnering with Investancia to introduce pongamia to Paraguay’s Gran Chaco. First a description of the Nitrogen Cycle. All living cells need nitrogen (N) to grow. Nitrogen is one of five key nutrient for all living cells as it is a component of both amino acids that are incorporated into proteins and of nucleic acids that are incorporated into RNA and DNA. In plants, N is further needed to synthesize chlorophyll molecules that are key to photosynthesis and growth. Thus the abundance or scarcity of N in the soil directly determines the quantity of food a given parcel of land can grow. Although atmospheric N is the earth’s largest source of this element, 78% of the atmosphere is molecular (N2); most organisms cannot use the gaseous form of N. Most living organisms depend on “reactive” nitrogen (Nr) that is “fixed” by biological or physical processes into inorganic forms of nitrogen like ammonia, ammonium, nitrogen oxide, nitric acid, nitrous oxide, and nitrate, and organic compounds like urea, amines, proteins, and nucleic acids (http://initrogen.org/index.php/about/). Human activities including fossil fuel combustion, use of artificial nitrogen fertilizers, and release of nitrogen in wastewater have negatively altered the global nitrogen cycle. Latin America is suffering from similar forces found globally that are creating a nitrogen challenge. Total global fixation of Nr in soil has doubled in recent history and excess fixed Nr has leaked into the environment impacting soils, waterways, and the atmosphere. In addition to Nr excess from human activity, mining of natural soil Nr and over cultivation of crops creates Nr deficits in some areas. In Latin America, high concentrations of untreated sewage in poor urban areas experiencing uncontrolled growth is causing rises in nitrogen in addition to phosphate in these areas. Even though soybeans are a legume and could fix nitrogen in symbiosis with soil bacteria, this crop is being cultivated in Latin America under high yield management practices that are depleting natural levels of fixed nitrogen. In the Argentina Pampa region where soil is naturally fertile, nitrogen fixation has not been stimulated, and N has been exported in soybeans grown in this region. In Brazil, converting pristine ecosystems high in natural N fixation rates to cultivated fields where fixation is not high is also causing reduction in N in soils. Biomass burning to clear land for agriculture, including soybean production transfers a large amount of Nr from land to gaseous forms of N in the atmosphere (nitrogen and nitrogen/oxides), redistributing N from one area to another and from fixed to atmospheric. Once removed from the soil and moved via the nitrogen cycle, this N is unavailable to plants in the region that was burned. The scale of biomass burning in Latin America is still estimated at 150,000 km2/year. TerViva is partnering with Investancia to bring cultivation of its new crop, pongamia, to the Gran Chaco, a vast un-developed area of northern and western Paraguay. This area is currently home to fewer than 100,000 people who manage 25 million cattle in an area about the size of the state of Pennsylvania in the US. As luck would have it, the Chaco also has a tropical climate with monsoonal rains where pongamia, is expected to thrive. As a legume, pongamia will be planted in areas previously cleared for cattle and cultivated as a perennial crop with annual seed harvests. Thus pongamia plantations will provide carbon sequestration in addition to nitrogen fixation. Trees will be planted in strip-tilled rows, leaving ground cover intact between rows. Once processing resources are in place, Investancia will develop programs that support farmers of small land holdings to cultivate pongamia. Pongamia’s raw oil product will be similar to soybean, high in oleic acid (eighteen carbon chain with 1 double bond) that is amendable to production of renewable transportation fuel or chemicals. However, pongamia harvests will be more economically beneficial at 400 gallons/acre compared to 60 gallons/acre for soybeans. Compared to the vast numbers of terrestrial plant species in nature, domesticated crops number few. Yet, humans will need new crops that will grow productively in abandoned or underutilized lands to meet the growing need for food, fuel, fiber, and chemicals. At TerViva we are domesticating one such promising plant, a legume tree with high oil seed content, pongamia. Pongamia seeds are a promising source of renewable oil for fuel and agricultural and industrial chemicals. For this blog posting, I would like to give a historical context for how humans domesticated two important food crops: corn an annual grain and almonds, a perennial orchard tree. Harvested primarily for its seeds, corn is consumed directly by humans and livestock, processed for packaged foods, pressed to expel cooking oil, and further processed for industrial purposes including ethanol for biofuel. Sugar-rich varieties called sweet corn are usually grown for human consumption, while field corn varieties are used for animal feed and as chemical feedstocks. The domestication of maize began some 9000 years ago and continues today. (http://en.wikipedia.org/wiki/Corn). Indigenous people in Mesoamerica first cultivated wild grasses in the genus of teosinte slowly selecting individuals in their cultivated fields that had more favorable properties. About 2500 BCE, maize began spreading through much of the Americas. Europeans brought this new world crop back to Europe after Columbus’ voyage of New World discovery in 1492. Because of its ability to grow in diverse climates maize spread to many areas throughout the world where it is grown today. During its slow domestication journey, humans bred a new species (Zea maize) that produces larger ears with a greater number of seeds than its wild ancestor. In addition, corn seeds are free of the stony casings produced by teosinte and they remain attached to the cob in contrast to teosinte seeds whose ears shatter for seed dispersal upon maturation. Humans also selected for taller plants without branches but with multiple leaves. Wild teosintes and maize, although considered distinct species, are still closely related, have similar chromosomes and are able to be crossed one to another to produce fertile hybrids. (New York Times, May 24, 2010). Early Americans were able to transform a grass with many inconvenient, unwanted features into a high-yielding, easily harvested food crop by painstaking trial and error because physical differences between wild teosintes and corn, result from only 4-5 genes. Sophisticated modern corn breeding that has further transformed this crop into a high yielding commodity began in the 1860s in the United States where farmers selected plants with high yields in their fields and produced seed to sell to other farmers. University supported breeding programs played a pivotal role in further developing commercial varieties and introducing modern corn hybrids. (Hybrid Maize Breeding and Seed Production pub. 1958). By the 1930s, corn-breeding companies such as Pioneer had begun to influence long-term corn varieties. The latest technological innovations being applied to corn and other major crops include genetic engineering to create transgenic or genetically modified (GMO) varieties of corn with specific traits such as glyphosate resistance (coupled with the herbicide glyphosate) to aid in weed management and genomics to mine and harness inherent genetic variation for further yield advances. One of the first domesticated nut trees, almonds show up in archeological sites of the Mediterranean dating to the Bronze Age, 3000-2000 BCE. Seedlings were planted on hillsides in regular arrays or orchards to escape frost. Wild almond species were already adapted to marginal soils and cultivated orchards were not irrigated. Early colonists brought almonds to the US including the earliest successful orchard in California in the foothills of the Sacramento valley in 1843, again without irrigation. growers were able to produce healthy orchards by planting seedlings from seeds. Thus, almonds were domesticated even before the introduction of grafting. In use before 2000 BCE. in China and spreading throughout Asia and Europe, grafting is an ancient horticultural technique still widely used today, whereby tissues from one plant are inserted into those of another and vascular tissues from the two different plants join together and the roots of one genetic type support the growth of branches, flowering and seed production of another genetic type. Using grafted trees, genetic selection proceeded along two independent tracks for roots vs. above ground plant traits. Almond rootstocks have been selected for beneficial root properties (resistance to nematodes, salinity tolerance, etc.) while above ground plant material or scion donors have been selected for nut yield and consumer preferences of texture and taste. Wild almonds taste bitter. Wild almond kernels produce cyanide when handled as during harvesting. Eating even a few dozen wild almond seeds at one sitting can be fatal. Selection of the sweet type, from the many bitter types in the wild, marked the beginning of almond domestication. Early growers in California failed to understand the need for cross-pollination via bees. An early California grower (AT Hatch) selected 4 varieties for grafting in 1879 and deployed all 4 in orchards to enable cross pollination). Other early California growers experimented further with new varieties and by 1925, the USDA listed more than 150 varieties in production in a technical bulletin (Technical Bulletin 1282). As with corn, academic research has played and continues to play a key role in almond variety development. The University of California provided much of the early research and evaluation of almond varieties. In recent years, USDA ARS scientists have developed a self pollenating variety of almonds (http://www.ars.usda.gov/is/AR/archive/apr10/ almonds0410.pdf) that may alleviate the biological necessity (and associated costs) for bees to cross pollenate almond orchards. Domesticated varieties of almonds like domesticated corn are still very close genetically to wild varieties. Genomic science is being applied to all major existing crops to improve growth and yield characteristics of already domesticated plants. These new technologies should help us shorten the domestication of pongamia from centuries to decades. Claire Kinlaw, PhD, MBA leads product development for TerViva, bridging plant science to what customers need for crop products. She has over 20 years experience leading plant genomics research projects and before joining TerViva she consulted in the fields of economic development and organizational development.